After a bit of time off work over the Easter break (largely spent without my computer!) I’m now tidying up some blogging ideas that didn’t quite get polished off before the holiday. At one point recently I made around 200 cupcakes within one week – in fact, it felt like I did little else in that week… So here are some of the recipe ideas that inspired me for these tasty treats! Two types of chocolate plus two types of berries equal two delicious varieties of cupcake: (Dark) Chocolate Mixed Berry Cupcakesand (White) Chocolate Raspberry Cupcakes. 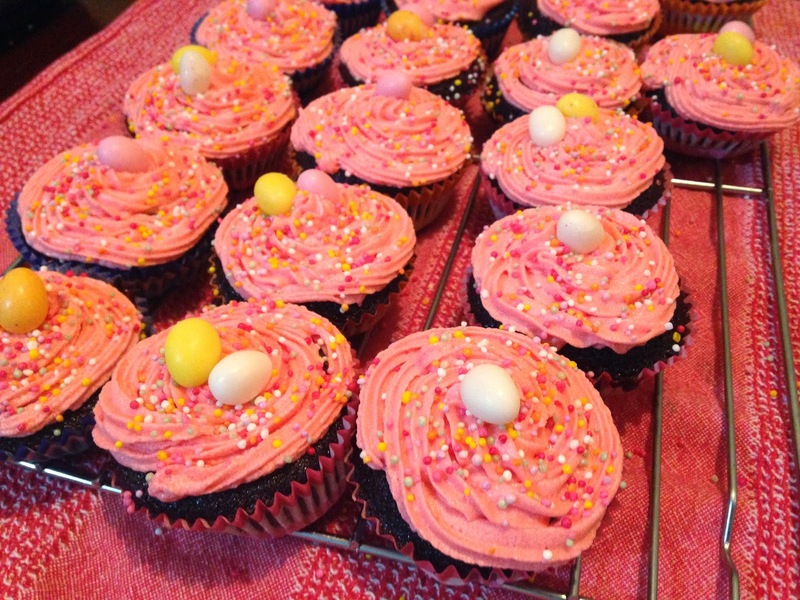 The dark choc/mixed berrytype were the basis for the Easter cupcakes below that I made for an after-church morning tea. This is Annabel Langbein’s recipe for One Pot Chocolate and Raspberry Cupcakes which is both delicious and easy, and has a decent cupcakes-per-egg ratio (my personal test for money’s-worth-iness!). For variations in the past, I’ve added half a cup of jam to the batter, used mixed berries instead of only raspberries, and used coconut milk to make up some of the yoghurt/buttermilk. It’s quite important to let the mixture stand for a few minutes before filling the paper cases if it’s runny, as this helps it to thicken. The cream cheese in the icing MUST be full-fat (see Baking flail post to demonstrate why…) and doesn’t set particularly well so make sure you can keep them refrigerated and transport them in trays without stacking. 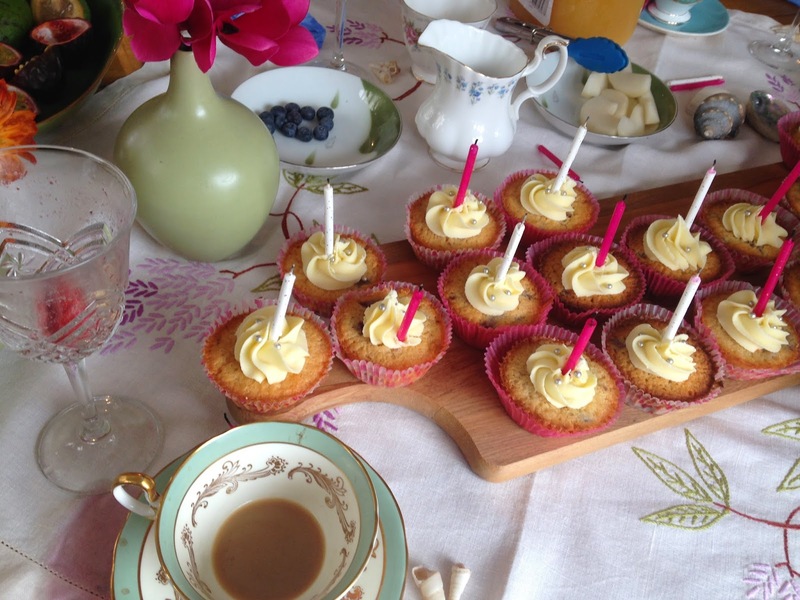 The white choc/raspberry cupcakes were the personal favourite of a bride-to-be friend, and served as birthday cake at her combined hen’s do and birthday party. White choc ganache swirls on top look and taste great! Two types of choc, two types of berry, two delicious cupcakes – tried and tested by yours truly! 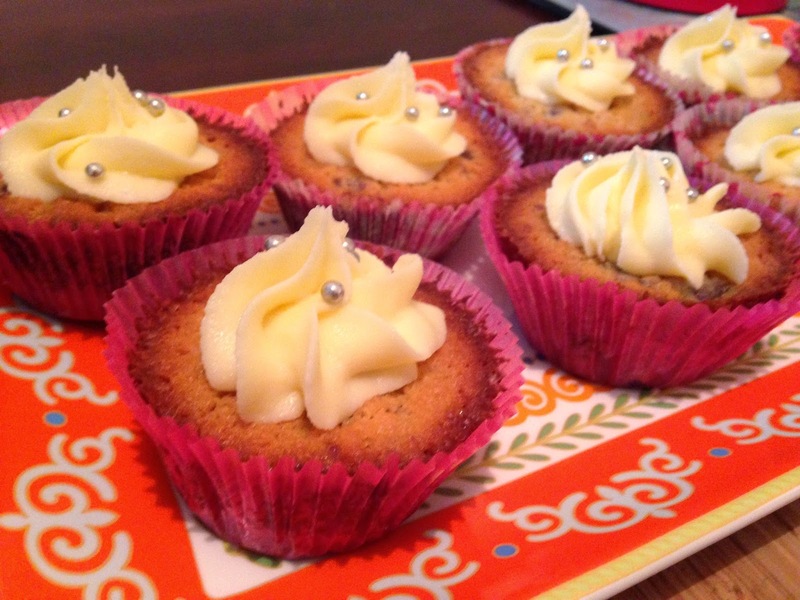 Previous Post Foodie Goes To The Food Show… and finds Julie Le Clerc’s Best Ever Vanilla Cupcakes! Om! Oh and your blog does inspire. I ended up making an ombre buttercream cake for W because of your post about yours. (No surprise that i made mine shades of green, though.) I've not made a white chocolate mud cake before…but wow, that particular recipe looks like chocolate thinly disguised as cake! Twice as much chocolate as flour!! Sounds delicious and i bet they were! Hehe yes lots of chocolate, but white choc doesn't have a strong flavour so often 'more is more'! I didn't find it too dense, either, with the berries mixed in 🙂 Hope that you have a go at them sometime!